Last time a ranking prelate (Cdl. Kasper) opined that half of all marriages were null his attribution of such a reckless assertion to Pope Francis himself could be dismissed as hearsay, deflected as referring to marriage in general and not Christian marriage in particular, or at least minimized as describing merely ‘many’ or even ‘half’ of all marriages. But none of those qualifications can be applied to blunt the impact of the pope’s startling claim “the great majority of our sacramental marriages are null”. If last time was bad, this time is very bad. Consider: Marriage is that natural human relationship established by God as the normal way for nearly all adults to live most of their lives. God blesses marriage and assists married persons to live in accord with this beautiful state in life. When, moreover, baptized persons enter this quintessential human relationship, Christ adds the special graces of a sacrament and assists married Christians to live as signs of his everlasting spousal union with his Church. To assert, then, that “the great majority of our sacramental marriages are null” is really to claim that the great majority of Christians have failed to enter the most natural of human states and have failed to effect between themselves the exact sacrament that Christ instituted to assist them in it. The collapse of human nature presupposed for such a social catastrophe and the massive futility of the Church’s sanctifying mission among her own faithful evidenced by such a debacle would be—well, it would be the matrimonial version of nuclear winter. I am at a loss to understand how anyone who knows anything about either could seriously assert that human nature is suddenly so corrupted and Christ’s sacraments are now so impotent as to have prevented “the great majority” of Christians from even marrying! How can anyone responsibly even posit such a dark and dismal claim, let alone demonstrate it? This is just a blog post so, simply invoking the same extensive credentials to speak on Catholic marriage law that I invoked two years ago, let me just say that I believe that the great majority of Christian marriages are valid, that a matrimonial contract was therefore effected between the parties at the time of their wedding, and that by the will of Christ an indissoluble sacramental bond simultaneously arose between those spouses. To be clear, I also hold that many marriages are (and could be proven to be) canonically null and that the percentage of null marriages has indeed risen over recent decades, but I can and do reject anyone’s claim that the majority, let alone “the great majority”, of Christian marriages are null. Finally—and I make this point mostly to preserve it for future discussion—the pope, toward the end of these remarks, made some comments about cohabiting and/or civilly married Catholics being in “a real marriage [and having] the grace of a real marriage”. Canonically (if I may be forgiven for mentioning canon law) such a claim is incoherent. Whatever good might be going on in the life of cohabiting and/or civilly married Catholic couples, it is not the good of marriage and it is not the grace of matrimony, but this—and here is my point—largely because of the Church’s requirement of canonical form for marriage. I would be glad to see the requirement of canonical form eliminated, but unless and until it is, cohabitation and civil-only marriage is not marriage in the Catholic Church. Join Franciscan University and Us (with Family’s!) in the Holy Land over Christmas Break! 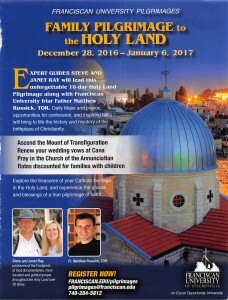 This is a “Family Holy Land Pilgrimage” where we are inviting families with their kids young and old to join us. We have added things to this pilgrimage for the young people. Grandparents, consider bringing your grandkids, or at least funding their trip. It is a great way to seal the Catholic Faith in their hearts and minds forever. By the way, parents and grandkids are willing to spend tens of thousands of dollars to send their kids to university where many of them lose their faith, why not spend under $5,000 to make sure then never lose their faith. A Holy Land pilgrimage can make all the differenc. For an interactive map, the itinerary and brochure, click HERE. Hope you can join us.